The 2014 Orange County Bus Program highlighted a need for a park-and-ride lot along the U.S. 70 corridor. The program was adopted by the Orange County commissioners and the GoTriangle Board of Trustees. The Orange County Bus and Rail Investment Plan was adopted. GoTriangle was operating a park-and-ride lot in North Hillsborough on private property from the summer of 2014 to the summer 2015. The property was sold and the new property owner told GoTriangle that the lease would end in the fall of 2015. GoTriangle has been actively working with the Town of Hillsborough and Orange County to identify a permanent location for a park-and-ride lot. We reached out to businesses, residents and a church in an effort to secure a location. We met with New Hope Church and discussed improving its parking lot to make it suitable for a park-and-ride lot. We had a number of productive conversations but were unable to reach an agreement. We expanded our search and met again with the town and county to discuss potential sites. We identified a potential location and have reached out to the property owner. We are evaluating the site to determine whether it is suitable for a park-and-ride location. We will continue to provide updates as soon as we know more. Served by GoTriangle Route 800 and 800S. Renaissance is a free park-and-ride lot in front of the HomeGoods along Renaissance Parkway. To access, enter the shopping center at traffic center near Tomato Jake's Pizzeria, turn right in front of Harvest 18 and then turn right into designated park-and-ride spaces. The park-and-ride stop in Wake Forest, stop #1811 (White St at Elm Ave), will be relocated effective Monday, August 6, due to construction. This relocation will cause some routing and scheduling changes to the WRX (Wake Forest - Raleigh Exress) and the WFL (Wake Forest Loop). Please add extra time to your journey. 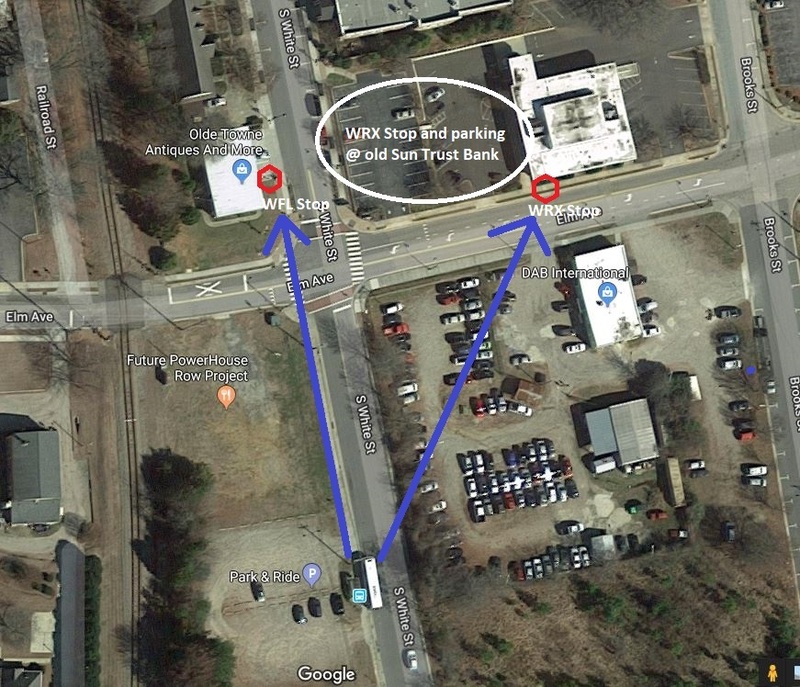 A new stop (#1099 - Elm Ave at Whie St) will become the new park-and-ride and end-of-line stop in Wake Forest, located at the old SunTrust Bank. Parking is available around this building. The WRX will no longer serves stop #1811. The WFL stop #1811 (White St at Elm Ave) relocated to just north of Elm Avenue. More information on the relocation can be found here. Please contact 919-485-RIDE (7433) with any questions about this stop relocation.